Travel is nice, but catching up with work and kids’ activities after travel is not fun. I was also a bit worried that because of my recent lack of updating on the blog, my small reader group would become even smaller. Then wise Mr. LF comforted me, “Blogging is a marathon, not a 100 meter race. Just keep posting”. The luxuriously frugal household did quite some travel in February. From Valentine’s day till the end of February, we have only worked 7-8 days in total (yes, both of us together). Mr. LF went to Washington D.C. with his sister and nephew. The whole family, eight of us, had a road trip to Orlando then Miami then Houston, a total of 2500+ miles. 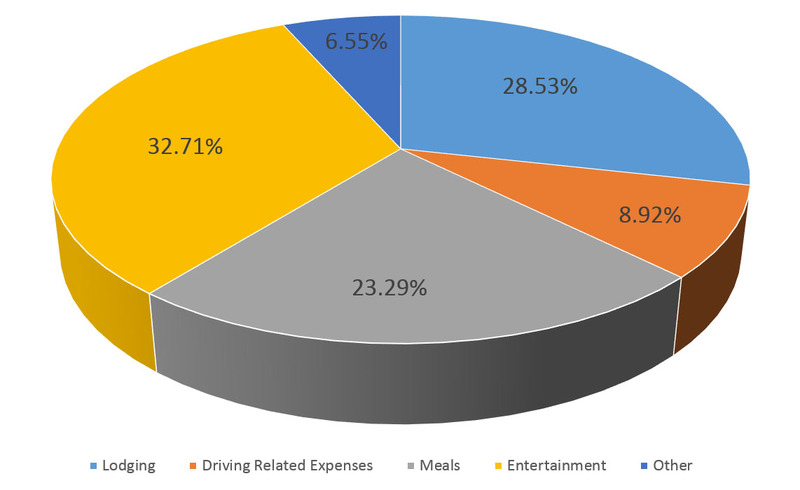 As expected, our expenses in February are high because of family visits and travel. In addition to the four of us, my in-laws and a nephew are with us for the entire February. My sister-in-law is with us for 15 days. So the expenses are really for a household of 8, or 7.5. For comparison, I also included the numbers from January. See the report for January here. These are the expenses that we don’t have much control of. Either because we are pre-committed to the payment (like Internet, cell phone plans, etc.) or we have to spend on them (like grocery, fitness, gas or utilities). For February , I am not sure whether I can still call many of these expenses non-discretionary. Grocery expenses decreased a bit ($1056 to $902). This is not really an improvement because we dined out much more this month. Dish Network: Subscription cancelled! This is the last bill! Medical expenses decreased from $176 to $72. 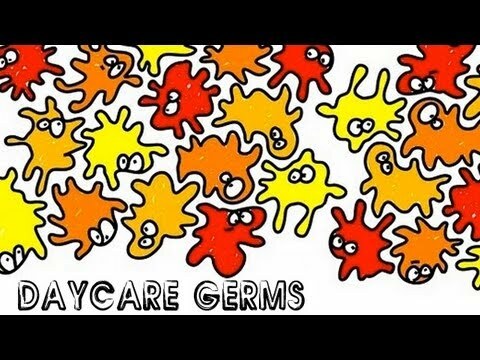 Kids only attended school for at most 10 days this month, which significantly lowered their chance of getting sick. Gas expense increased from $144 to $470, thanks to the road trips. Car Maintenance is quite high this month due to a payment ($964) for car insurance. Other than that, we only spent $5 for a car wash.
Home maintenance increased from $406 to $546. I forgot to include cleaning and lawn maintenance costs in last month’s expense report as I use a separate bank account to pay for these expenses. But they are now included. Our cleaning lady comes once a week for four hours ($25 per hour) and the yard man comes once every other week ($35 each time). The numbers do not really add up, because I only record the expenses when the checks are actually deposited and debited from our account. Our cleaning lady also buys cleaning supplies for us, which explains why the numbers do not necessarily end with a 5 or 0. Dine-out: $878.66. We ate out a lot in February, as we wanted our loved ones to try every favorite restaurant of ours in town. Clothing items: $228.57. Visited an outlet on our way home from Orlando. Ralph Lauren was having some amazing sales. Mrs. LF picked up her first orange blazer and first pair of long pants in polka dots. Mr. LF picked up a few shirts and a sweater. All at 70% off. Gifts: $1,215.6. We spent a lot on gifts this month, for friends we visited on the road trips, and for my parents-in-law, sister-in-law, and nephew. Travel: $1,125.37. This includes lodging, meals, transportation, tickets, etc. for our travels. I use cash method when logging the expenses, which means the expenses are logged not at the time of occurrence, but at the time the expenses are actually debited from our bank or credit card accounts. Please see this post for a complete expense coverage of our road trip to Orlando-Miami. Kids entertainment: $0. Not because they did not need to be entertained in this month, but because they have been entertained too much with all the exciting travels and family visits. 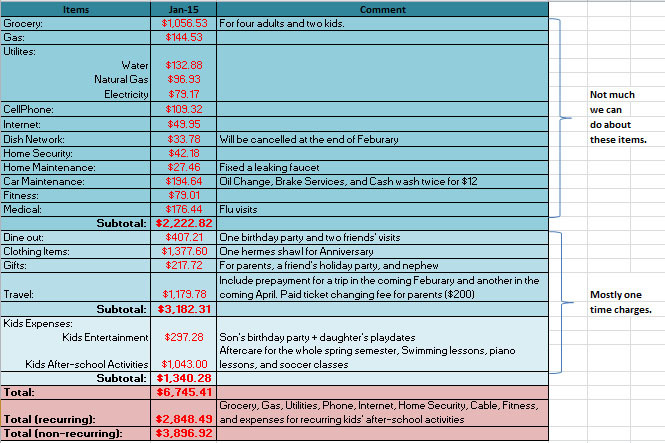 Kids’ after-school activities: $709.25. Prepayment for D’s violin lessons in the spring semester. $172 monthly piano lessons for D, $50 monthly dancing lessons for M.
b. Monthly health and dental insurance payment for the whole family (pre-tax dollars): $814.67. For March, our expenses should be lower. I have almost forgotten how a normal spending month would be as we have been travelling too much and had frequent family visits in the past few months. Cannot wait to get the March numbers! How did you do in February, any suggestions on how to cut our expenses? Thank you so much for reading! Had some dental work done this morning. My dentist’s office is not close to my home or my office. I need to drive 30 minutes one way to see him (which is pretty far in a city where it takes less than 20 minutes to go almost anywhere). He does not have the best price, nor the best service. But a random chat with him a year ago made me stick with him. About a year ago, I asked him why he rotates in three offices and works long hours. He said he needs money, a lot of money, because he has five kids to take care of and the youngest one is a special need child. I don’t think my fees to him make much of a difference (as I mostly just need routine cleaning), but I prefer to give my money to a responsible dad. Plus, if I only visit him twice a year, I can stand the additional 10 minutes of driving. Assumptions: Assume we follow Jim Collins’ advice and invest $50,000 every year in Vanguard Total Stock Market Index Fund (VTSAX). Investments are made at the beginning of the year and fees are paid at the end of the year. Expense ratio: 0.05% per year, which means you pay 0.05 cent as fund fees for every dollar invested in this fund. No other expenses. Case 1: No financial adviser. Invest in the fund myself. Case 2: Hire a financial adviser to invest in the fund and pay him 1% a year. (Note: this does not have to be a difference between with or without financial advisers. The same logical/analysis applies when comparing index funds vs. actively managed funds. The latter often has an expense ratio 1% higher than that of the former). The red bar shows total investment value at the end of each year for 40 years when we only pay an expense ratio of 0.05% a year (case one). The green bar shows total investment value at the end of each year when we pay an expense ratio of 0.05% plus an additional 1% management fees per year (case two). These two bars use the left axis (investment value). The blue line shows the % difference in the values of these two scenarios. The blue line corresponds to the right axis. One percent annual difference in fees leads to 6.31% difference in total investment values in 10 years, 13.76% difference in 20 years, 22.92% difference in 30 years, and 33.86% difference in 40 years. To put these percentages into perspective, it is a difference of $46,588 in 10 years, $300,509 in 20 years, $1.15m in 30 years, and $3.58m in 40 years. OH MY GOD! 1% = $3.58 million! How about the differences in fees you paid? The red bar shows annual fees for a 0.05% expense ratio. The green bar shows annual fees for a 0.05% expense ratio plus 1% additional fees to financial advisers. The differences are apparently huge! For example, the annual fee is only $1243.03 in year 20 for case one and the corresponding number is $23,167.45 for case two. In total, assuming you started investing at age 25 and retired at age 65, you would have paid $1.3 million more in management fees if you choose to have a financial adviser that charges 1% every year. In year 40, you, yourself alone, are paying a six-figure annual salary ($112,241) to the financial adviser. Wait! What if my financial adviser is good and can generate returns higher than that of VTSAX? Except for some years in the 80s, most actively managed mutual funds (the ones with higher fees) underperform the market. This chart compares the performance of actively manged funds to that of the market, which does not take risk into consideration. The risk of these actively managed funds is often higher than that of the market index. On a risk-adjusted basis, about 80% of the actively managed funds underperform their benchmark in the past 10 or 15 years (see details here). For the past 10 or 15 years, 70%-80% of actively managed mutual funds underperform the average return of low-cost index funds. For funds that invested in U.S. stocks only (the first two bars), 70-80% of actively managed mutual funds underperform index funds in all horizons. 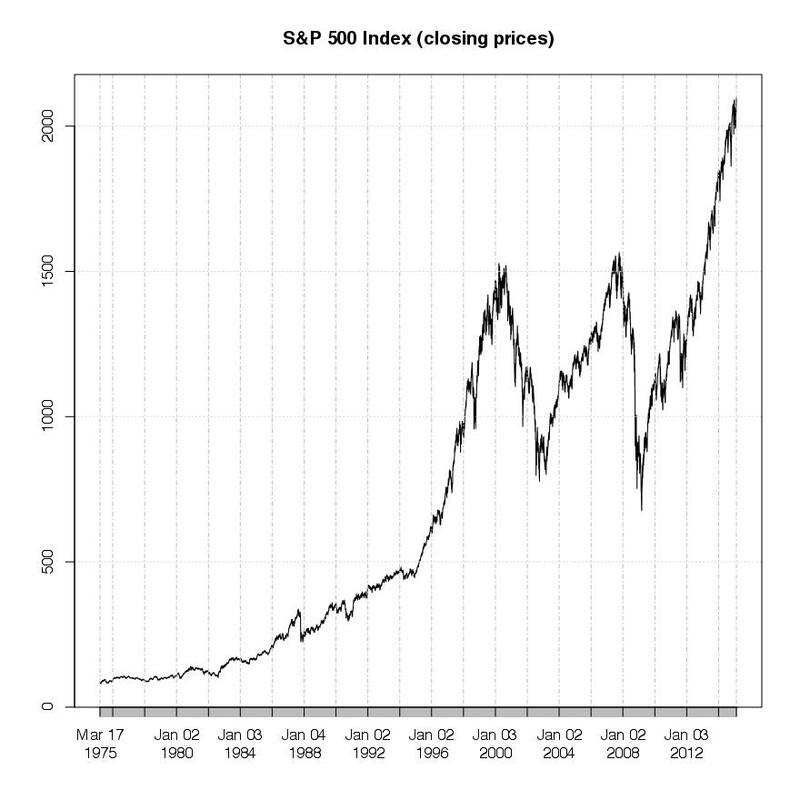 For more discussions on the performance of index funds and actively managed mutual funds, please read this paper by Vanguard researchers and this article by Jim Collins. Wait again! 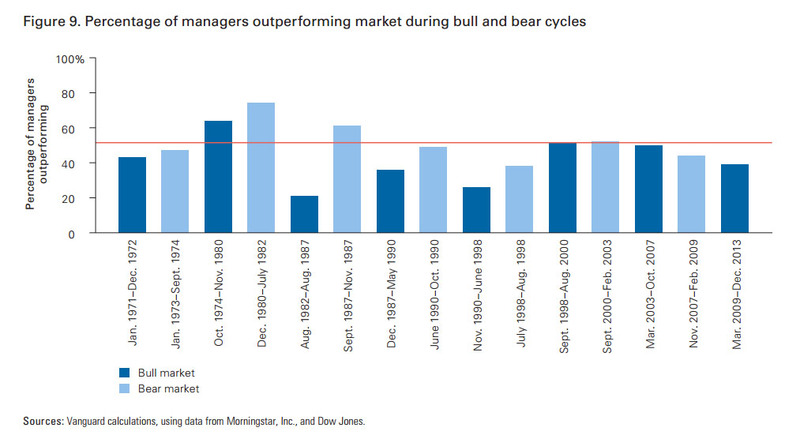 There are still good managers that can outperform the market. My manager could be one of them! That may well be the case. But the odds are not in your favor. You are much more likely to have an underperforming manager than an outperforming manager. There are more managers than stocks. It is not any easier to pick a winning manager than pick a winning stock. 1. Never underestimate the power of 1%. 2. Invest in low-cost index funds. 3. In most cases, it does not make any sense to hire a financial adviser to manage your investments. It looks like the cost of financial advisers will be significantly reduced by the robo-advisors. But even at the predicted expense ratio of 0.25%, these robots still cost you more than index funds. a. You would not invest otherwise. If you just put 50,000 in a safe every year, you will have $500,000 in 10 years, $1m in 20 years, $1.5m in 30 years, and $2m in 40 years. These numbers are significantly lower than if you have used an adviser to invest. In this case, I would strongly urge you to hire one, even if they charge 2% a year. This may well be the case of my dentist. b. You need help with other personal finance decisions: For example, the asset allocation decision, i.e., how to distribute your money between equity, bonds, real estate, cash etc. The concept of asset allocation is not hard, but the implementation can be challenging. Many times, it is a battle between rationality and psychological bias. It might be easier for a third party to fight the battle for you as she is likely more objective (to your money, not to hers). This is where I think the robo-advisers can be of great help! c. If you know a “Warren Buffet”, then by all means, dive to his funds. But often times, these super-talented managers get to choose their investors and are normally not interested in retail investors like us. What are the expense ratios of the funds in your retirement portfolio? If you are paying much higher than 0.05% a year, you may want to reconsider your options. Even if you don’t have access to Vanguard funds in your retirement plans, many fund companies now offer index funds with expense ratios below 0.2%. Jim Collins has a nice post on this: see here. If you want a copy of the workbook that I used to generate the graphs, please contact me here or leave a comment below. Last week, we had a road trip to Orlando-Miami. Left home on Tuesday and returned on Sunday night. In addition to our family of four, we also have parents, a sister and a nephew travelling with us. So, a party of eight! 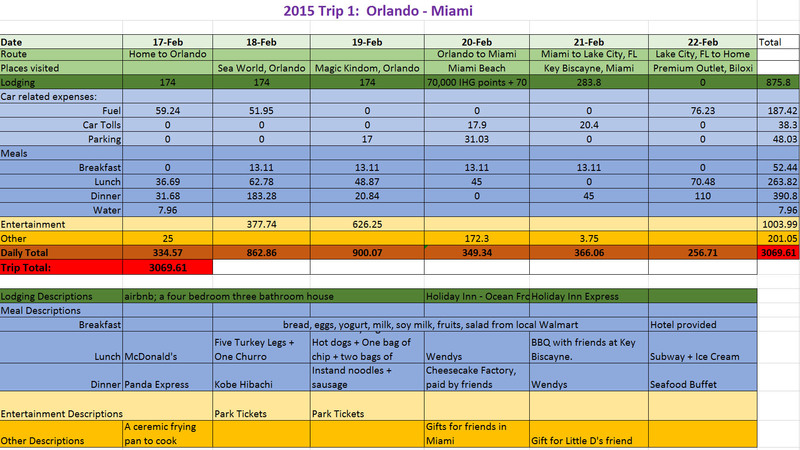 Our trip expenses are detailed below. The upper part shows how much money we spent each day on the items listed in the first column. The lower part tells where the money went exactly. (3). Get into the parks right at their opening time, which means 9am. And stay ’til we drop! We stayed till 7pm for Sea World and till 9:30pm for Orlando. For Sea World, check out the show times first and time the attractions accordingly. For Magic Kingdom, get three fast passes online (you can do this 30 days in advance) for your must-do attractions. Before entering the park, download the mydisneyexperience app to your phone. It tells you the waiting time for each attraction and can help you time/plan the activities accordingly. (5). Get into the Magic Kingdom before their price increase on March 1 (From $99 to $105). This was a pure luck. We didn’t know the scheduled price increase for Disney parks. It seems that they have a tradition to increase park prices in March (for those of you, early retirees, that have the luxury to time when to go to the parks). Till March of 2016, every person (>=3 yrs old) needs a Benjamin Franklin and an Alexander Hamilton to get into the parks. The park price has increased more than 4 times since its opening in 1971. I miss those days when it only cost less than one Benjamin Franklin for both me and Mr. Luxuriously Frugal to have a magical date day in the Magic Kingdom. We used airbnb to book a four bedroom house in Orlando for $522 ($174 per night). This is a much better deal than booking three hotel rooms for three nights. The house is within walking distance to a Walmart, so my parents-in-law enjoyed touring the Walmart (they have been to Disney parks before and do not find any utility to go any more) while we were touring the parks. For the oceanfront Holiday Inn at Miami Beach, it cost about $399 per room per night for the day we were there. I used 70,000 IHG points plus $70 dollars to book two rooms for that night. Not the most efficient way to use the points, but I really did not want to pay $800 for one night in Holiday Inn. For the last night (Feb 22), we did not want to book a hotel in advance because we were not sure how late we would stay in Miami and therefore, how far we could drive on that day. But a casual check in the morning of that day suggested that all the hotels were fully booked between Orlando and Gainesville. Worrying that there might be some events that could knock out all the rooms, we booked a hotel room in Lake City, FL. When we arrived the hotel that night at 10pm, a big sign showing “No Vacancy” is hanging on the door. We were lucky to have booked the room in the morning. Had we waited till the afternoon to book, we might end up driving till midnight to find a place to stay. I asked the guy at the front desk for why all the hotels are booked out? He looked me as if I were from Mars. “You don’t know? 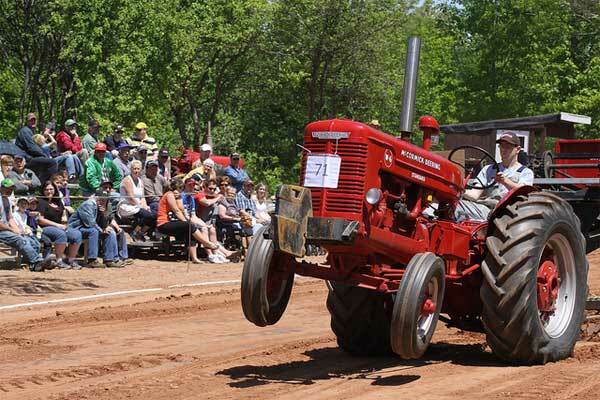 Daytona 500 and Tractor Pulls!” This might also explain why there were so many people in the parks at a time we thought should be a low season. In total, we spent $715.02 for food-related items, about $5 per person per meal per day. Being close to a Walmart significantly reduced our spending for breakfast ($52.44 in total). One third of our lunch $ went to turkey legs. 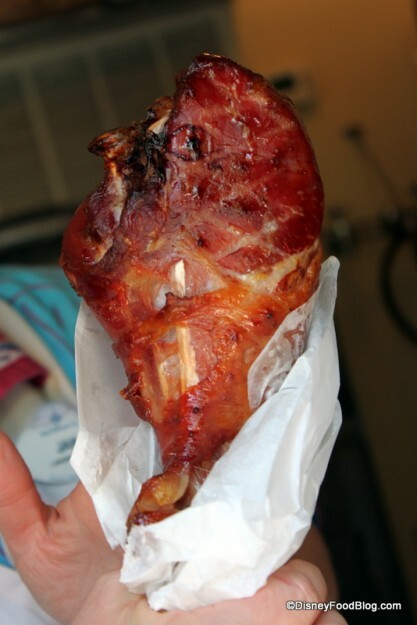 Oh, that juicy, yummy, turkey leg! Had a dinner ($183.28) at the Kobe Steakhouse in Kissimmee. Good food and service! Would recommend if you like Japanese Hibachi. Dinner in Miami, paid by our friends, was at Cheesecake factory in Dadeland Mall. This is the best Cheesecake factory I have ever tried. But the best dinner during the whole trip was the instant noodle soup plus sausage plus spinach leaves. Nothing beats a hot noodle soup after a freezing day in the parks (seriously, 30s and 40s in Orlando?). Florida Turpike is getting more expensive. But spending $19 to buy an hour of 8 people? I will pay it. Parking was crazy at the Miami beach hotel ($29 per night). Otherwise, really cannot complain much about spending less than $190 to transport 8 people from our home to Orlando-Miami and back. Got some nice liquid, alcohol and a Glamglow facial mask, for friends in Miami. Kids behaved incredibly well this time. The only item little D got is a magnet for his friend’s birthday ($3.75). Little A is enchanted by all the princesses and could not squeeze anything else into her mind. So she happily left the parks with just an enchanted mind. It was a magical trip! Do you enjoy visiting South Florida? Thank you so much for reading! Sale Alert: A “Sale Alert” page has been added to the top bar. The page would be updated on a weekly basis. Dropped little D at his school this morning. As usual, our car is the worst among all the cars that were waiting in the carpool line. What are the typical brands in his school’s carpool line? 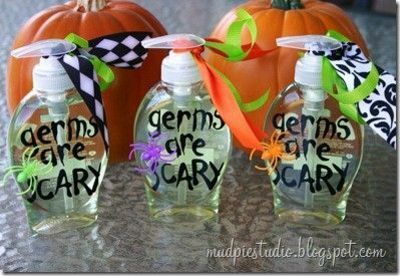 Photo source: 1, 2, 3. 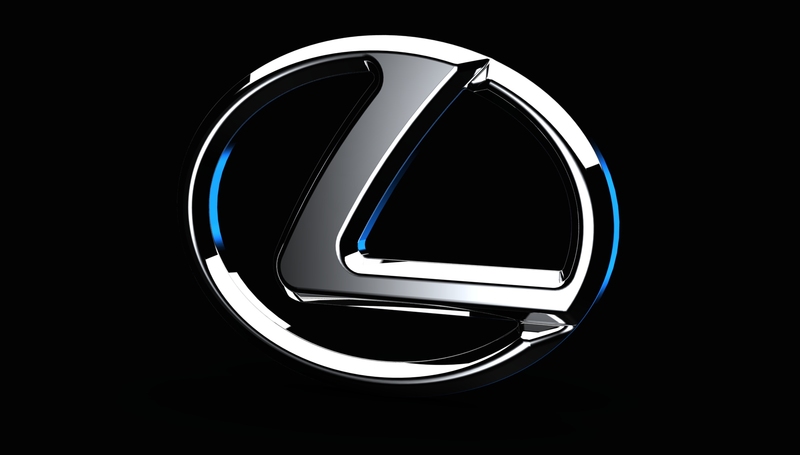 When you do see cars from these brands, they often look very new. A 2002 Honda CRV. Ours looks like the above picture when we bought it brand new in 2001 and it has been loyally serving our family in the past 14 years. Well, it still looks like this but just had a few wrinkles, some freckles, and small patches here and there. It survived a french kiss from another car in 2005 and as I am writing this post, has more than 145,000 miles on it (I will have another celebration post when we join the 150,000 miles club). 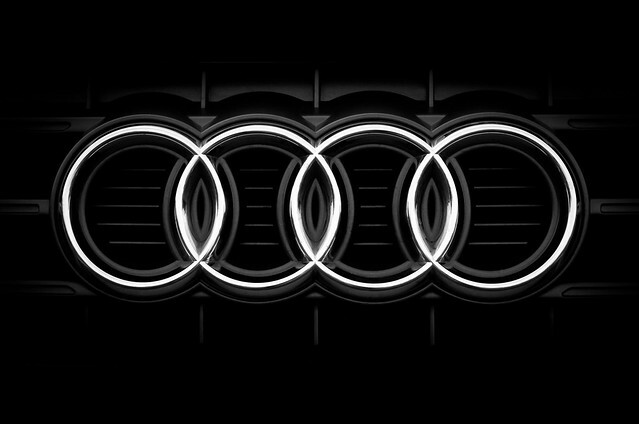 Can we afford a new car in a more luxurious brand? Yes. But I don’t see any reason to do so. Why we need a car? To transport ourselves or families from one place to another. Is our CRV doing this job? Yes, beautifully and reliably. The car is very efficient too. It costs about $20 to fill it up with the current gas price. A full tank lasts us two weeks. It is also very roomy. Our family of four can easily fit into the car with a plenty of room to stretch and a large trunk to carry loads of goodies. A few years ago, when my husband was buying a truck for his business, we explored the possibility to trade this car in. At that time, the car has a little over 100,000 miles and is about 10 years old. The dealer told us the car is worthless and he can give us a few hundred dollars at most. But then he said, “Don’t trade it in. You are better off just keeping the car. It can still run years and years. It is a great car.” I was puzzled at first why they don’t want to pay a reasonably price for a descent car. Then I realized this is because there is no market for it: Very few people will buy a 10 year old car with more than 100,000 miles. Is a car with 100,000 miles really an old one? Based on what I have seen from Drivetofive’s blog, Honda cars have the potential to go to 500,000 miles and beyond. Apparently, our car is still in its adolescent years!!! Then why so few people want it? Because it looks cheap and outdated! Who wants to look cheap and outdated? Got a job! Time to upgrade the car to show that a job is secured. Got promoted! Time to upgrade the car to differentiate ourselves from ordinary employees. Got a fat salary! Time to upgrade the car to match the size of the salary. Joined a country club! Time to upgrade the car to match the other cars in the club’s parking lot. Kids’ started going to a private school! Time to upgrade the car to keep up with the other cars in the carpool line. Wait, I heard someone saying that he/she wants a better car because the driving experience is better. Really? Really? I cannot speak for other people, but for me, I cannot tell much difference. Unless the car drives itself, we are stuck in a small space where you need to work your foot and hands on gas, brake, and wheel. The mom showed me around. 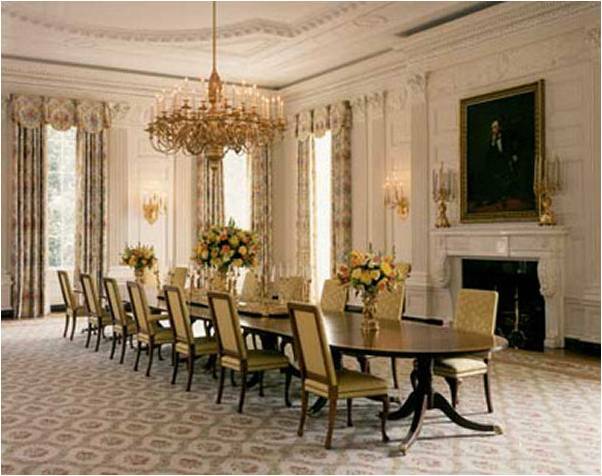 While I was admiring each room of the house, I was also quickly calculating in my mind how much more money we should earn so that we can buy a house like that. By the time we are in their laundry room, which is big enough to host a birthday party of 15 kids, I have settled on a number and a plan to achieve that number. I almost wanted to excuse myself from the cooking, so that I can put every minute of mine into working toward that goal. I eventually stayed as a responsible mom should do. It is at that moment I was awakened. There is no end for material possessions. You can always find larger and better houses. Rather than living under the stress of getting more and more, it is a lot easier, happier, and simpler to be grateful for what we already have. Is my son bothered that our car is the worst? Not at all. Since we never comment on how good or bad is a car that other people are driving, he is not paying attention to car brands at all. But we did tell him that we had the CRV since I was dating his dad, how the car has taken us to wonderful places, and how it picked him up since he was born. In his mind, this is the perfect car for our family. Whenever he sees another old Honda CRV on the road, he gets very excited and waves to people in that car. Once, I was a bit early in the carpool line, he proudly pointed our car to his classmates and shouted “That is my car!” Back when he was about three and half, he had his first playdate at a friend’s house. The families at his daycare come from very different economic backgrounds. The house of the boy he had the playdate with was small and not in a very good condition. When I was dropping him off, he commented “what a small house!”. He did not know that was a rude comment. After I picked him up that day, I asked him “do you know what is a good house?” He looked me puzzled. I told him a house is good as long as people inside it love each other and take care of each other. He thought that was the official definition of a good house and has been applying that definition since. I tell this story not to show that I have a high moral standard (I am just an average person with an average standard), but want to illustrate that kids can be taught to not pay attention to the coats of things. We have no plan to upgrade the 150,000 mile CRV and the 100,000 mile truck. And I am a proud mom that drives the worst car in the carpool line. Are you a new car or old car person? Love to hear your thoughts. Nothing is free in this world, even not fresh air. Then why do I have a post called Free Money? When I first found this source of free money, I did not believe it either. There must be a catch! I told myself. So I signed up and have been cautiously waiting for the catch. However, six months later, the free money is indeed coming in every month with a catch that has not showed up yet. Well, not totally free, you need to spend some time to set it up initially (about 30 minutes) and then maybe, if you are anxious like me, you will spend three minutes each month to monitor the process. What is the return for your three minutes? $20 dollars, which is $400 per hour. If you are not anxious, then you can set it up and forget about it, which will make an infinitely high hourly rate (because the denominator is zero). What? You don’t have 30 minutes to setup a money printing machine that prints you money every month? Come on, you spent two hours surfing on the web without a purpose, you binge watching a TV series for hours, and you snooze your alarm for 30 minutes every morning. There is time. It all depends on how much you want to do it. I happen to love money a lot (who doesn’t? If you don’t, please dump your hated money here! 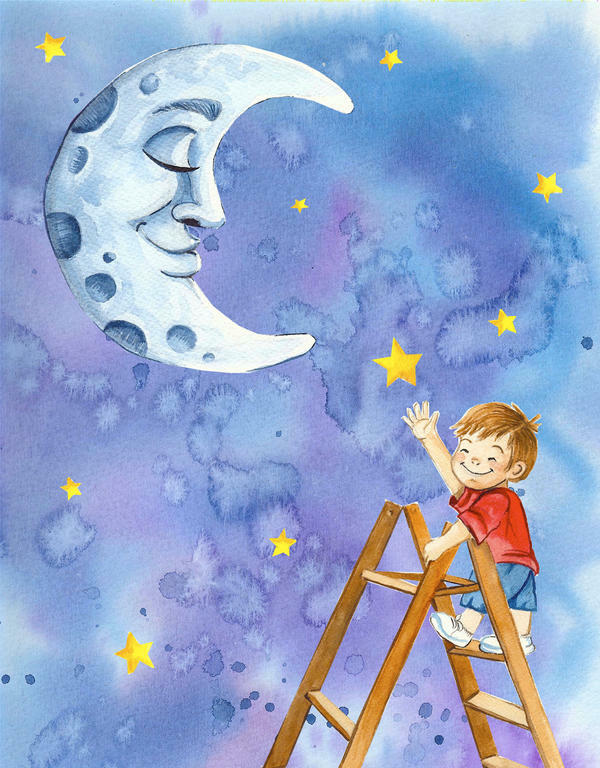 ), no matter big or small! So it does not take too much effort to lure me into a deal like the Santander Extra 20 checking account. What I was skeptical of is the process. Will the process be smooth or full of hiccups? Will they delay the payment? Are there a lot of restrictions to get the $20? Too much hustle? No! You can setup automatic actions for both items and then the money will flow in automatically forever (well, at least till they cancel the policy). What do you need to do initially? Step 1: Open extra20® Checking and extra20SM Savings accounts. They will ask for your social security number. But this is a soft pull, which means it will not affect your credit score. Step 2: Deposits a minimum of $25 dollars to the checking and $10 to the saving. It seems that they have changed the rule a bit. When I opened my account last fall, there was no deposit requirement for the savings account. But the good news is that you can use a credit card to make the deposit. And yes, you do earn points on your credit card (you may want to google to see if you can earn points for your credit card when you use it to fund a bank account. I knew Citibank is pretty sensitive and may classify this as a cash advance instead of a purchase). I used my Barclay 2% credit card to make a $500 deposit (maximum allowed on a credit card funding) and did earn 2% on the $500 deposit. Step 3: Setup an automatic transfer to Santander from your main bank account. In my case, Chase hosts my main checking account. From Chase’s online banking website, I setup an automatic online transfer of $1500 to Santander on the 3rd day of each month. Yes! You don’t have to have a direct deposit from your paycheck. An ACH debt push like this is also counted as direct deposit for Santander. Step 4: Setup two automatic billpays on Santander’s online banking website. I use the $1500 I transferred to Santander in Step 3 to pay my main credit card. I have setup two billpays, one $1000 bill pay and the other $500 bill pay, to the same card. 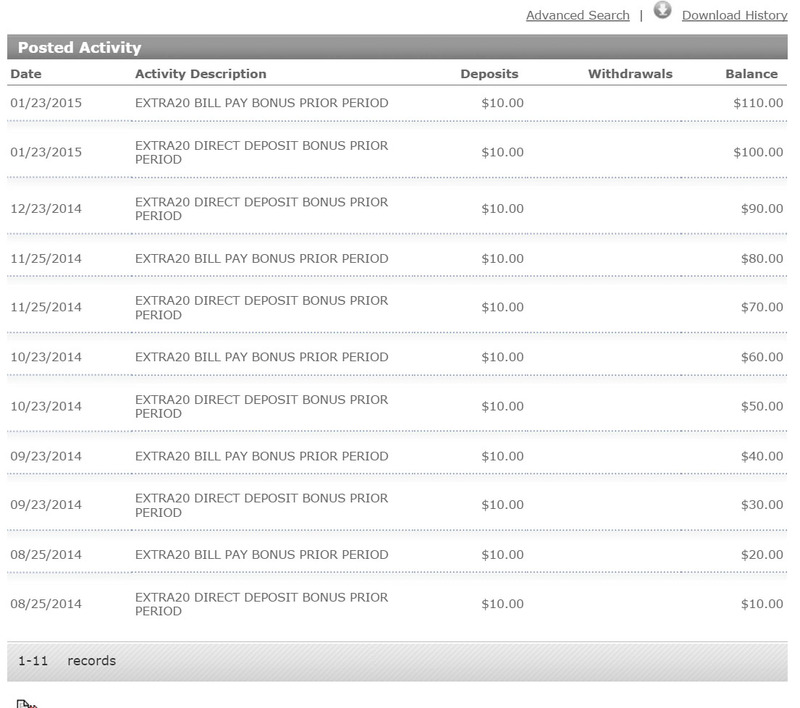 Step 5: Receive $20 in your extra20SM Savings account at the statement close date for that month. The table below presents my statement of cash earnings in the past six month. What do you need to do every month? Nothing. Just watch your money grow! As shown below, I got $110 for free! It is not $120, because I turned off the billpays in December as I lost the credit card. For all the other months, I am getting $20. Depends. For me, I will totally do it because $240 ($173 after tax assuming a 28% marginal tax rate) a year is enough to cover the annual registration fee of my son’s soccer club or his aftercare fees for one semester. Why you may not want to do it? a. You are already making >$400 an hour and you feel this is a waste of your time. b. You spend less than $1500 a month. c. You don’t use credit card. d. You don’t like anything that is automatic. Would you take advantage of this deal? If not, why not? Love to hear your opinion. Disclaimer: I do not receive any commission from Santander by posting this. What I shared here is my honest opinion. This post is provided for informational purposes only and is not intended to substitute for obtaining professional financial advice. Please thoroughly research everything you read here before acting on any information you may have found in this blog. Dear husband’s comments on the last post:”It is a joke to write about Hermes on a frugal website.” I kindly reminded him, it is not a frugal website, it is a Luxuriously Frugal website. But I do admit that sometimes I feel like a person with double personalities. On one day, I am in total love for luxury items and would not mind spending big $ on them. On the other day, I am carefully planning my route to work so that I can save $2 on gas. However, I really don’t mind which personality is in control, as I am equally happy either way. 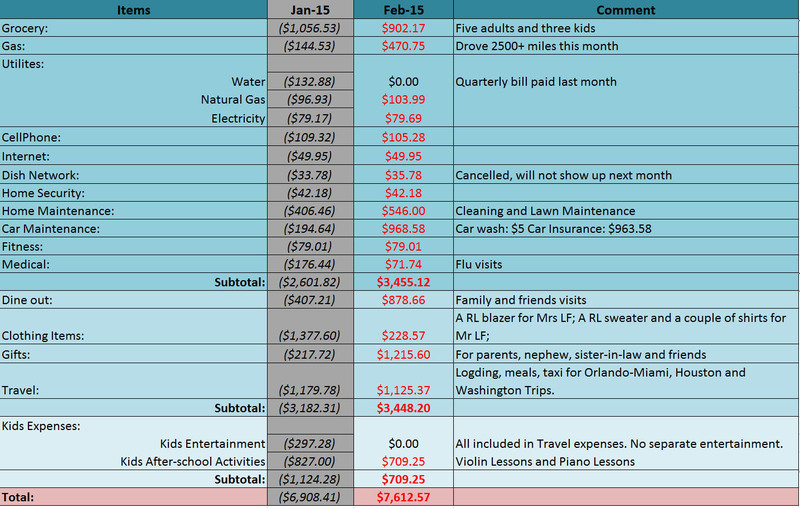 Our expenses in January are high because of family visits and prepayments for kids’ school and travel. In addition to the four of us, my in-laws are with us for the entire January. So the expenses are really for a family of six. For a family of six, I feel we are doing okay. Per person cost is comparable to the Frugalwoods household and lower than the gocurrycraker household. However, I must note that this is not a fair comparison, as we do have a large chunk of discretionary expenses. And also, using six in the denominator is not really justifiable, because the marginal cost per person is not the same. For example, even without my in-laws and kids living with us, we will still incur the gas, utilities, service, and fitness bills. But nevertheless, this number helps me to see what would be the minimum amount that we would need if we choose to retire early. a. Cancel the dish subscription at the end of February. We don’t watch much TV at all. If we need to, we can watch on the internet. There is really no reason for having a subscription when we don’t use it. We have decided to cancel our subscription at the end of February. b. Car maintenance should be lower: We did a maintenance service for one of our cars in January, that explains the higher expenses. In February, our car maintenance costs should be < $20, primarily for cash wash.
Dine-out: $407.21. We eat out five times in January. The first two were due to a friend’s visit. The last two were due to little D’s birthday. The other one was going to a seafood buffet, which is a cheap place to have a lot of seafood. If we cook the same amount of seafood at home, we would end up paying more. So whenever, we want be stuffed with seafood, we go to this place. Clothing items: $1,377.60. This is not our norm because I picked up a Hermes shawl for our anniversary. Without the shawl, our expenses are <$200. Gifts: $217.72. We bought several clothing items for parents. It also included three birthday gifts for Little D and M’s friends. Travel: $1,179.78. This included prepayments for lodging for our Disney trip in February and Utah trip in April. This also includes $200 ticket change fees for our parents. Kids entertainment: $297.28. Mostly due to little D’s birthday party. Little M had a playdate in the zoo, which cost about $25. Kids’ after-school activities: $1,043. Prepayment for little D’s soccer club and aftercare programs in the spring semester. $172 monthly piano lessons for D, $50 monthly dancing lessons for M, $75 monthly swimming club fee for D.
For February, our expenses will be high again due to a planned trip to Disney and the visit of my sister-in-law’s family. We often spend more in the first half of the year because this is when we travel more and have more family visits. Any suggestions on how to cut our expenses? Thank you so much for reading!